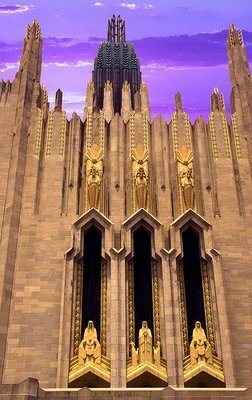 The Boston Avenue United Methodist Church, an art deco treasure, is dramatically lit by the setting sun in Tulsa. Oil money in the 1920s accounts in large part for Oklahoma’s Art Deco architectural bonanza and Frank Lloyd Wright’s prairie skyscraper, Price Tower, built by Harold C. Price for his pipeline company. This trip begins with a Tulsa Historical Society walking tour of downtown Tulsa and continues after lunch with one of its driving tours. Wright’s only cantilevered skyscraper is the primary draw for a night and morning spent in Bartlesville. After lunch, a drive around town with a GPS loaded full of addresses takes us to sightings of the Frank Lloyd Wright-inspired Bartlesville Community Center, designed by the vice president of the FLW Foundation, at least four Goff houses and his Redeemer Lutheran Church Education Building. To take best advantage of this itinerary, time your trip for June and enjoy the OK Mozart Festival in Bartlesville. The Tulsa Historical Society provides downtown walking tours the last Friday of each month. The exterior of the 1931 Philcade Building, where my downtown walking tour starts, is a prime example of Art Deco, as is the 1928 Philtower Building across the street. I’m ready for Deco in all its styles: ZigZag, PWA (Public Works Administration) and Streamline Moderne. The Deco period in Tulsa ran from the early 1900s into the ‘50s. Don’t ignore the MTTA Downtown Transfer Center. This Deco Revival building, erected in 1999, suggests how committed Tulsa is to honoring its Deco heritage. In keeping with the theme, Mom and I head to the New Atlas Grill, a fantastic little restaurant inside the Atlas Life Building. Before I can eat, though, I have to admire the building itself. The huge exterior sign is a landmark in Tulsa. The building is full of gorgeous Deco elements. Don’t miss the crouching figure of Atlas on the building’s crown or the Atlas with a clock rather than the world on his shoulders inside. Small but mighty… mighty good, that is. That’s how I describe the New Atlas Grill. The homemade black bean veggie burger here is truly the best I’ve ever had. Open for lunch and breakfast Monday through Friday, this unassuming little nook packs a solid lunch, with daily specials. I could have gone for the portabella mushroom sandwich, as well. I will return. Mom, the carnivore, has a chicken fried steak. We both have the hand-cut fries. We don’t leave a bite. If you want to start the day here before your walking tour, go on a Friday and choose from a wide array of omelets and house specialties, including Marmie’s homemade granola. After lunch, we head out in the car for a quick stop at the Tulsa Historical Society. Everyone there is friendly and willing to help us enjoy our Deco tour in any way possible. When you go, print out the walking tour and several driving tours from the website. If you forget them, they’ll supply copies. The gift shop has Oklahoma-related items. A couple of hours in the car lead us to many of Tulsa’s Art Deco landmarks. The Tulsa Art Deco Society, which works to preserve and publicize Tulsa's rich architectural heritage, played host to the 2001 International Art Deco Congress. I can’t imagine how excited those folks must have been as they drove from one gorgeous building to another. We "ooh" at the awe-inspiring terracotta-bedecked and "ahh" at the Boston Avenue Methodist Church, which Bruce Goff had a hand in designing. Goff, who counted Frank Lloyd Wright as a mentor, was largely self-educated. We stop a couple times, but a slow cruise-by is enough to satisfy in most cases. After our two-hour walk this morning, the drive is a nice change of pace. The Adah Robinson Studio is another Goff building you ought to swing by before heading out to Bartlesville, where Goff is amply represented. Rooms in the intimate Inn at Price Tower are filled with Frank Lloyd Wright touches, from copper towel rods to angular furniture to an orange-and-turquoise color scheme straight from the master’s palette. Comfort is the key here, though, while it wasn’t always in Wright’s designs. Stories abound about Wright removing personal items from an apartment or home if he thought they interfered with his aesthetic or with form trumping function whenever a client’s latter interfered with the architect’s former. The elevators that go up to what were originally apartments in Price Tower are a case in point. If they are too small for most furniture, guess whose streamlined designs would be in the rooms? Wright’s dislike of decoration not his own made it tough to put stuff on walls. Harold Price, builder of Price Towers, got Wright to back down a bit by giving Price permission to paint a quotation from Walt Whitman on a reception area wall. The Copper Bar on the 15th floor of Price Tower, Wright’s only built skyscraper, is a lovely place to spend a couple hours in the evening. It serves what it calls light food, but for us, it is more than sufficient. That New Atlas Grill lunch has stayed with us. I have a nice glass of wine, and mom goes for her usual iced tea. Mom’s steak salad is actually a meal. She says it is superb, with steak slices, crisply cooked green beans, potatoes and spring greens. My tomato bisque and Gouda grilled cheese are good, too. After delicious coffee in the room and an included continental breakfast, we take an hour-long docent-led tour of Price Tower – which is part of the Price Tower Arts Center – starting in the museum. There we find an exhibit on Fallingwater, the Pennsylvania home that is arguably Wright’s most famous structure. The gift shop has a great selection of Wright items. Our tour is fascinating. We learn that the tower is shaped like a tree, growing thinner as it goes up. In fact, only one of three elevators goes to the top of the building because it’s so small at the top that only one can fit. Seeing the inside of one of the preserved apartments and Price’s office on the top floor is a major treat. Goff lived in one of the apartments for a time. Before lunch, we stop at the Bartlesville Area History Museum, where we find good background information about Goff structures in the city to complement the Bartlesville Driving Tour that the Tulsa Historical Society has provided for this architectural treasure trove to the north. We find street addresses here to plug into the GPS, which takes us where we want to go without a hitch. Both of our lunch stops on this road trip are so good as to be destination restaurants, in my book. Frank and Lola’s Neighborhood Restaurant and Bar in Bartlesville feels like a transplant from a super-cool city in which boutique food is valued, and in a way it is. Hailing from Denver, chef-owner Adam Gilbert is an American Culinary Federation program graduate with three years’ work as an apprentice at hotels and resorts in Colorado. His wife is a Bartlesville native. They decided to raise their two children, whose nicknames are Frank and Lola, in her hometown. Everything is homemade. The housemade bleu cheese dressing is the best I’ve ever had. To talk about the bread pudding – which Adam bakes only halfway, then finishes right before serving – brings tears to my eyes. I have a tasty artichoke dip with veggies, and mom, who might be nicknamed Burger Queen, has the eight-ounce hand-shaped Plain Burger, which she says is the best she has ever had. Goff designed eight homes and several other outstanding buildings in the Bartlesville area. We drive past most of them. What a treat. The one we can’t drive by causes pain even to think about. Shin’en Kan – Chinese for “the house of the faraway heart” – is the home that a still-unfound arsonist destroyed in 1996. The Price Tower Arts Center has the greatest collection of Goff materials outside the Art Institute of Chicago; they include building fragments, furniture, paintings and decorative elements. The houses are lived in and set among more traditional neighborhood structures, so you can’t enter them. The high school and Redeemer Education Building have sizeable parking lots, so you can stop and gawk as long as you want.